After seeing its reach increase for decades, international support for democracy and human rights now faces a serious challenge. 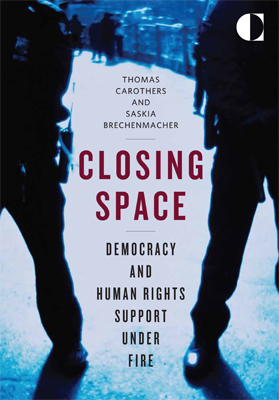 After seeing its reach increase for decades, international support for democracy and human rights faces a serious challenge: more and more governments are erecting legal and logistical barriers to democracy and rights programs, publicly vilifying international aid groups and their local partners, and harassing such groups or expelling them altogether. Despite the significant implications of the pushback, the roots and full scope of the phenomenon remain poorly understood and responses to it are often weak. Pushback is global. The phenomenon no longer emanates from only a few countries and is not only directed at a narrow part of the democracy aid community. Dozens of governments around the world, democratic as well as authoritarian, are lashing out at a wide spectrum of democracy programs and groups. The trend is lasting. Restrictive measures against international support for democracy and rights are not temporary setbacks. Pushback results from fundamental changes in international politics that are likely to persist for the foreseeable future. The response is inadequate. International reactions to the pushback phenomenon include diplomatic pressure, attempts to strengthen the international normative framework of freedom of association, and new adaptive programming. But competing interests, diverging donor perspectives, and a lack of coordination have weakened responses. Deepen understanding of the problem. Organizations engaged in democracy support should invest the necessary institutional resources to assess the full scale of the pushback problem and develop clear policy responses. Coordination on responses needs to be strengthened and extended to a wider set of aid actors. Account for demonstration effects. Given the pattern of copycat actions by hostile actors, aid-providing governments must shape responses based on a full consideration of the wider effects that their stance in any one country can have. Explore new aid methods in more depth. Aid providers need to go further in investigating how innovative methods—such as support for protective technologies and new forms of distancing—can make aid more effective in less hospitable political environments. Improve NGO-law diplomacy. Efforts to pressure governments not to adopt restrictive NGO laws have surged as an area of diplomatic engagement. Aid providers should seek to capture learning from these experiences, disseminate best practices, and strengthen such efforts. Bolster international frameworks and advocacy efforts. Concerned governments and international NGOs should continue their efforts to fortify standards for civil society protection at the United Nations, within regional organizations, and in the post-2015 development agenda. Yes, democratic ideals have been used as a shield to advance the strategic interests of many countries and in return they have weakened democracy, rule of law and have polluted the natural environment peoples basic freedoms. The U.N. could be the way to go in solving this problem. in italie sems to not stay in occident. on my life i had esperimented negative active e restricted activitye of rights : abuse of officer in police and security goverment area , often they use tecnology status tu interference in to private life of citizen for politic controlle e managing of data like a busy. it is not a problem to trample the rights . By assistance does he mean loans from the IMF? or the world bank. Loans that are conditional with austerity measures on the population and the allowing of foreign corporations to pretty much plunder that country's resources and take advantage of a desperately poor labour force! Perhaps he means aid packages. Which seem more like bribes to the local government elites ensuring their country remains a third world service state. The USA and the western world are actively suppressing democracy! Don't take my word for it. look up Noam Chomsky on youtube. About this topic, I think international community need to focus on new strategies in order to encourage promotion of democracy and human rights. For me donors are though by the local communities as foreigns with a top down vision of their problematics. Indeed, it is essential to be creative and work from the local to the national to gain confidence in the territories. In this way, I consider, donors and NGO are going to have a decisive role in the promotion of democracy and human rights.